Kayak.com has a very cool new tool using Google Maps. Enter the city you are leaving from and the region you are flying to, and it will show you the cheapest airfares on a graphical map. If you love to travel by train, or are looking to save some money when you travel next, Amtrak is having a sale of train travel. Fares are up to 90 percent off. 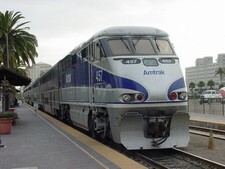 For example, traveling from Atlanta to New Orleans can be done for as low as 31 dollars one way. That is a significant savings over airfare between these two cities. Visit Amtrak today to save with their Hot Deals. A geeky tool, RSS, is entering the mainstream, and the travel industry is learning that it can be very useful for pushing out deals and bargains on specific cities and flights for travel. Travel sites are, like many other Internet companies, stuck using the acronym RSS, which computer geeks have dubbed this process. The acronym stands for “Really Simple Syndication” – a term that is not particularly user friendly; “grabbing” is a more appropriate word. Regardless, for now users must look for the little orange (usually) RSS box, as on the front page of Orbitz.com or Sidestep.com, or type in the Web address of the site’s RSS feature (for example, rss.travelocity.com) to which they want to subscribe. From there, the process is often as simple as billed. On Orbitz’s RSS page, for instance, you click on the category of deals you want featured on your MyYahoo page, like flight deals or hotel and vacation deals to a specific destination. After signing into your personalized page once, those deals appear and are updated according to the schedule of the travel site. via New York Times . If you are interested in RSS, or using it already, do not forget to click on the orange RSS logo on our sidebar to sign up for The Travel Bloggers Feed. We put the whole feed into your RSS reader every day. Amazing Airplane Near Miss Over London? Sky News has a a series of pictures take by a photographer in East London. 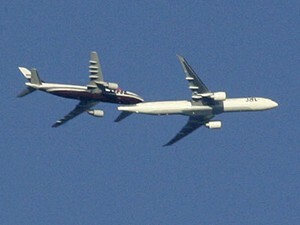 The pictures show what looks to be a near miss between a DHL A300 and a Japan Airlines 777. The London officials are saying it was an optical illusion caused by the clear skies, but it would have scared me. See all 6 pictures here. The combination of a sporting facility, casino, and hotel resort in Las Vegas is an interesting concept that has some great potential for success. It also has the potential to be a 4 billion dollar bomb. Why do I say that, well the biggest danger to sports is if the fans learn a game is fixed. Typically this happens when sporting events have wagering on them and pressure is applied to athletes to fix the score of the game. That is why you can not place bets in Nevada on Nevada college sports. Yet now you are going to have a destination that will feature live events and betting under the same roof? I think the idea is interesting, but at the slightest whiff of scandal, the whole enterprise could come crashing down. So this will be a huge bet placed in the home of the gamblers. It will be interesting. The project is based on a hybrid “casino,” “destination,” and “sports” business model. For instance, the final name of the resort will be determined through a naming rights deal similar to those recently associated with stadium, arena and title sponsorships in sports. The resort will provide sports-minded consumers with unparalleled access to watch sports, play sports, test state-of-the-art sports equipment and enjoy the finest assembly of sports memorabilia, collectibles and trading cards. In addition, visitors can purchase the widest range of sports-related products in the world. Ultimate Sports Entertainment Inc. enjoys the support of the United States Olympic Committee, more than 25 National Governing Bodies and countless sports organizations who are interested in holding regional and national competitions at the resort once it is completed. Ultimate Sports Entertainment Unveils $4 Billion Las Vegas Plan – RGT Online . What are the pilots of World Airways thinking? They go on strike in the midst of the worst airline recession in the history of the industry, and not because of pay cuts like every other airline is taking, but because the raises are not high enough. With the layoffs just in the Peachtree City headquarters town of World Airways (right outside of the Atlanta Airport and Delta base), there are 3 times that many pilots who are out of work. And it is not like World Airways is not having to pay the same fuel costs as the rest of the industry. Amazing. World Airways, a subsidiary of Peachtree City, Ga.-based World Air Holdings Inc. (NASDAQ: WLDAE), offered its pilots, represented by the International Brotherhood of Teamsters, two options. The strike could result in a loss of customers if prolonged. Some of the commercial flights have been protected through sub-service with other carriers. The contract does not allow World Airways pilots to interrupt U.S. military flying, which is the largest part of the company’s business. via bizjournals.com . As much as I believe in civil liberties, I have no trouble with identification being required to fly on commercial airplanes. As has been shown on 9/11, airplanes have the potential to be weapons, and access to them needs to be monitored and regulated. court agrees. A panel of judges in San Francisco has dismissed a legal challenge which argued that the requirement for showing identification amounts to an illegal search. Libertarian activist and millionaire John Gilmore claimed the policy also violated his right to travel freely. But the judges unanimously ruled that the security provision is not overly intrusive. The court says Gilmore can leave the airport if he doesn’t choose to show his I-D, and that he has other ways to get around besides air travel. For years Quantas has been given a near monopoly on the Sydney to Los Angeles route. Singapore Airlines has been actively trying to fly this route for ten years to no avail. But in an interesting twist, Air Canada has been authorized to start flying this route. Air Canada has announced plans to launch a daily service on the route with its new fleet of long-range Boeing 777s. “We believe it’s time to get in there and compete,” said the airline’s Australian general manager, Jeannie Foster. Air Canada said a recent open skies treaty signed between the US and Canada would allow it to fly the previously barred route. The announcement comes two days after the federal Tourism Minister, Fran Bailey, met Air Canada officials and opened a Tourism Australia office in Toronto. via the Sydney Morning Herald . The door is still open for the Singapore Airlines to get attain this route, but the odds are severely diminished. A New Luxury Hotel Group is on the horizon. 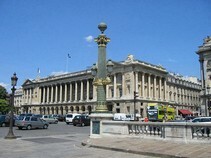 Starwood Capital Group today announced plans to launch a new international luxury brand called the Crillon through its Societe du Louvre affiliate. The company will develop European-style Crillon hotels and serviced residences in major destinations throughout the world. This has to fall into the “you have to be kidding me” category, Iran is requesting direct flights to the United States to be reinstated so that passengers do not lose their luggage. Here is a country that is close to war with the United States over nuclear weapons development and they want to reinstate direct flights. Oh, sure, leave politics out of it. Sure. “They have repeatedly complained about wasting time and losing their baggage on connecting flights,” the official said. Iranian airliners have been barred from the United States since the US government broke ties with Tehran after the 1979 Islamic revolution. An Iranian civil aviation spokesman said Ahmadinejad’s decision did not signal any move to try to improve relations between the two old foes. “I hope American officials do not adopt a political stance in making a decision on this request,” said spokesman Reza Jafarzadeh. via AirWise News .